Now that's one New Year's resolution we can help you keep! The 2019 BNP Paribas Open is less than 2 months away! Join us in the desert this March and experience the very best that this sport has to offer, all set against the unmatched backdrop of Tennis Paradise in full bloom. Reserve your seat now and start counting down the days until you experience the incredible tennis, cuisine, desert sunshine, atmosphere, backdrop and talent at the 2019 BNP Paribas Open. There's still time to make your 2019 tennis dreams come true! The 2018 Margaritaville USA Pickleball National Championships will involve players from the valley and take place at the Indian Wells Tennis Garden, Nov. 3-11. That’s how Justin Maloof, executive director of the USA Pickleball Association, describes the build-up to his fast-growing sport’s 10th annual National Championships, which for the first time will take place in the valley, Nov. 3-11, at the Indian Wells Tennis Garden. The time is certainly right for that step up to centerstage: pickleball’s growth has been dramatic. Originating in the 1960s, this ingenious mixture of tennis, ping-pong, and badminton currently boasts about 3.1 million players across the country. Even more indicative of pickleball’s wide-spreading popularity is the fact that the USAPA, the sport’s national governing body, has seen a staggering 620 percent increase in its membership since 2013. VIDEO: Local playersKim Jagd, Morgan Evans, and Sherri Steinhauer share their start in the game. But while the numbers are astounding, what fascinates Maloof more right now is the way championship week is going to feel for those involved: he can’t even begin to imagine the dream-come-true thrill players are going to experience as they take to the 45 converted courts at the Tennis Garden. “We’ve never had an opportunity to play on a world-class venue of this caliber,” he says. 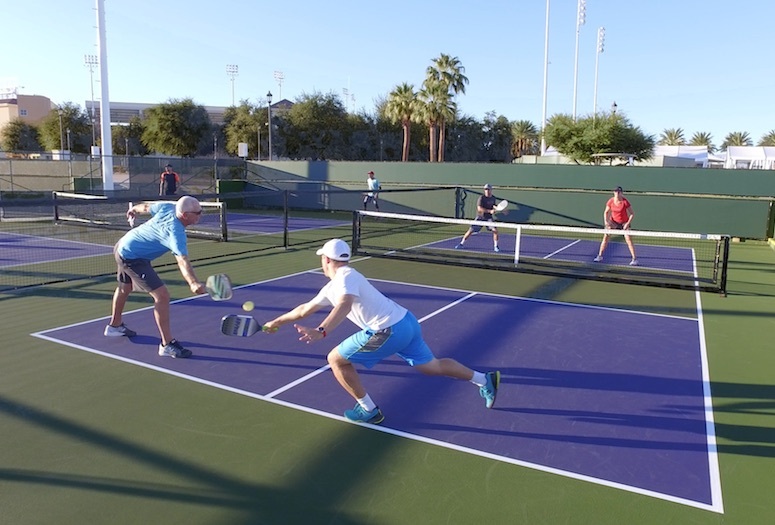 Yet while that’s the case for most of the contenders at the National Championships, who’ll be traveling from all over the country to Indian Wells, the Greater Palm Springs pickleballers already get to enjoy the splendid setting at Indian Wells. Introduced at the facility just over a year ago by far-sighted IWTG Club Director Fred Hartzman, pickleball now occupies a handful of re-purposed courts every Wednesday evening, plus Saturday and Sunday mornings. Both Bowling and Philips, who usually participate in doubles and mixed-doubles matches, advised anyone interested in joining the local ranks to look for an introductory clinic or instruction session, which are available at such venues as the Palm Desert Community Center and Gymnasium, where indoor pickleball is scheduled three days a week from 10 a.m. to 1 p.m. There were around 30 or so fellow players out on the courts with Bowling and Philips that night, and while the two women acknowledged that their own games aren’t yet ready for nationals-level competition, many others who were in attendance will participate. The tournament will start early each morning featuring singles, doubles, and mixed-doubles matches, across many skill-graded categories and age-group brackets from teens to the over-80s. Supplementing the on-court competition will be exhibitions and instruction. Best of all for spectators, entry to the IWTG grounds is free, and there will be a variety of dining and entertainment options. There will be a charge for parking and a fee for attending matches on the main championship court. For news and details about the 2018 Margaritaville USA Pickleball National Championships, visit usapickleballnationalchampionships.com. Pickleball Basics WHAT IS A PICKLEBALL COURT? 20-feet wide by 44-feet long. Net 34 inches at the center, 36 inches at the sideline posts. The “kitchen” is the seven-foot area immediately in front of the net; if you’re in the kitchen, you can’t volley (that is, no “spiking” from up close). Singles and doubles played on the same lined court – no doubles alley. Paddle – there are approximately 80 different models available. Ball – plastic “whiffle” ball, the size of a tennis ball and perforated with 40 holes; indoor and outdoor varieties to choose from. Underhand serve across net on tennis-like diagonal. Hit ball after it bounces. After three such bounced strokes, but not before, ball can be volleyed out of the air. Only serving player/team can score. Game to 11, must win by two. Two out of three games wins match. There are several accounts of how the sport was named. Here’s our favorite: when the founding inventors began playing their first games, in the driveway of a home on an island in Washington State back in the 1960s, they tired of having to retrieve errant shots and enlisted the family dog to do the fetching. Pickles the dog was happy to oblige, and that enthusiastic service to the sport’s beginnings will be remembered for as long as pickleball is played.